The S mine (also known as Bouncing Betty or the Splittermine in German) was one of the most lethal versions of German mines in World War II. When the mine was activated, it would launch into the air and detonate approximately three feet in the air (just shy of three feet at 2 feet and 11 inches). When the mine detonated, it would spray shrapnel in a 360 degree direction and was designed to take out unprotected infantry and military personnel. 1 When was the S Mine Created? 5 How Does the Bouncing Betty (S Mine) Work? 7 How was the S Mine Detected and Disarmed? When was the S Mine Created? The S mine was first produced in 1935 and was a critical component of the German defensive strategy of the Third Reich. For the 10 years the mine was manufactured, there were more than 1.93 million devices created. Over the production run, the two variants of the mine produced were the SMi-35 and the SMi-44 with each model having minor differences. During WW2, the S mine was responsible for slowing and repelling invasions into German territory and helped inflict large numbers of casualties on Allied forces. Due to the success of the S-mine, many other countries would imitate the design throughout the war. The first time that the S-mine was encountered during combat was between September 7-11, 1939 during the Saar Offensive. The deployment of the mine resulted in the French army suffering numerous casualties and the French withdrawing. Based on the performance of the mine during this timeframe, German leadership decided to further deploy the device in defense of the country and other occupied territories. Over the course of WW2, the German army continued to expand the deployment of the S-mine to help take the place of infantry forces. 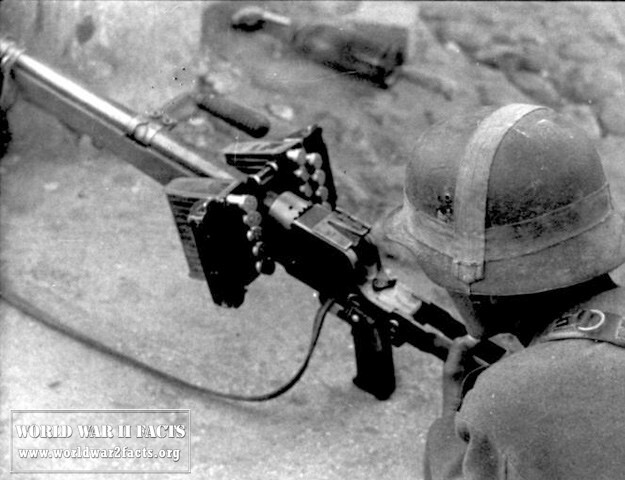 In defense of the pending Allied invasion of Italy, the German Tenth Army deployed more than 23,000 S-mines. Later in the war, the Germans deployed a large number of S-mines on the Normandy beaches. Just off of Utah Beach on Îles-St.-Marcouf, Rommel ordered millions of both S type and other mines deployed forming what the Germans called the “Atlantic Wall.” Throughout WW2, the Germans established the tactic of using S-mines along with anti-tank varieties to help withstand the advances of both Allied tanks and infantry. After World War 2 was over, production of the S-mine did not continue by either East or West Germany. Although not officially documented, destruction of the remaining stockpiles of the S-mines is believed to have occurred by the Allied Powers following the war with the exception of keeping a number of the mines for exploitation and reverse engineering. 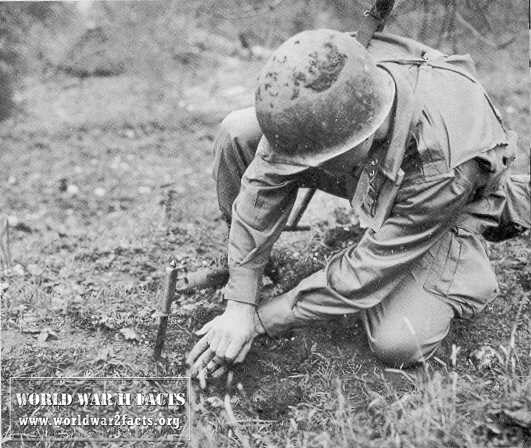 An American infantryman probes for landmines using a knife. large number of personnel to undertake the task of de-mining Western Europe. In France, more than 49,000 German POWs were used to augment French personnel to complete this task. 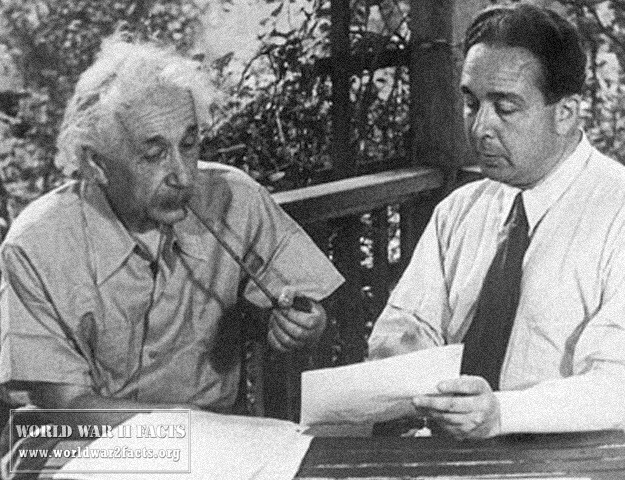 Aiding the efforts was the Germany military policy of accurately recording the location of all mines and minefields. Despite these efforts, there are still occasional incidents which occur in France, Germany, former Warsaw Pact countries, and North Africa today. Both Eastern Europe and North Africa still have large WW2 era minefields that have never been cleared or verified to be cleared due to incomplete records of the minefield placement. To date, there is still a large portion of farmland that is not usable in Libra (up to 27%) due to minefields put in place during the war. Although the S-mine was rated to only have an effective lifespan of two to seven years by the Germans, the explosives contained within the mine have still been found to be active more than 70 years after being placed in the field. 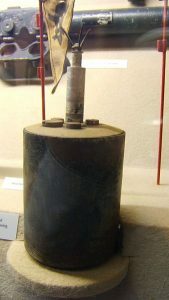 The S-mine was made up of a steel cylinder that was less than 6 inches in height and just under four inches in diameter. There was a steel rod that stuck out from the top of the mine which held the primary fuse of the device in addition to the sensor or trigger of the mine. 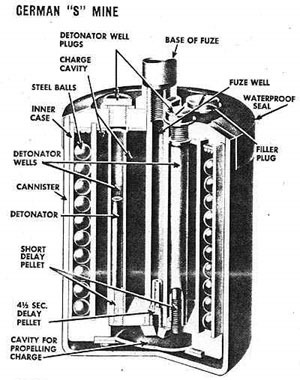 The SMi-44 had an offset fuse while the SMi-35 had a central fuse with the entire mine weighing approximately 8.8 lbs. 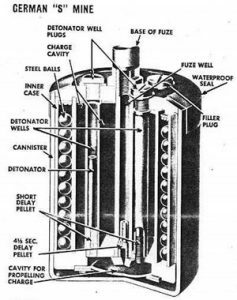 The final weight of the mine would ultimately depend on what variant of TNT was used in the device (either the heavier poured TNT or the lighter powdered TNT). The propelling charge used in the mine was black powder and the pressure sensor used a percussion cap in order to ignite the mine. 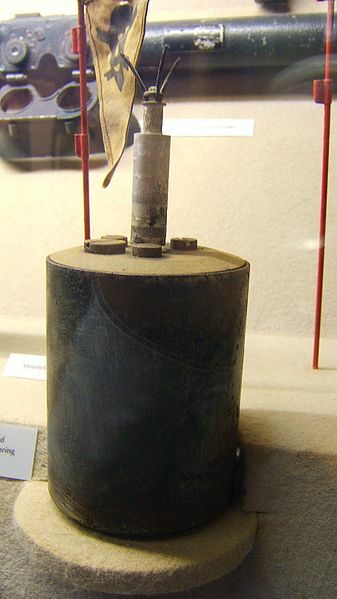 The Germans designed the primary fuse to delay the firing of the propelling charge for approximately four seconds after the S mine was originally triggered. The propelling charge would send the mine into the air and would active three short delay pellets between the propellant charge and three detonators in the mine. The short delay pellets would allow the mine to reach the designed height prior to it exploding giving the mine it’s nickname, Bouncing Betty. The pressure sensor only took a weight of 15 pounds or heavier to set the mine off. This helped ensure wildlife would not activate the mine; however, would generally activate when set off by people. How Does the Bouncing Betty (S Mine) Work? The S mine would be triggered by a three pronged pressure fuse when a person stepped onto the mine. The Germans were able to modify the mine to be triggered by a tripwire by using a special tripwire adapter. In order to accept any standard German trigger or ignition, the steel tube on the mine which held the fuse was threaded. This also allowed the sensor to be removed and the mine to be manually set off or triggered by a human. Once the Bouncing Betty was set off, the mine would be fired up into the air between 2ft 11 inches and 4ft 11 inches in the air using a propellant charge. Less than a second later, the main charge of the S mine would detonate and severely injure or kill anyone in the immediate area of the mine. Surrounding the mine was approximately 360 steel balls, scrap metal pieces, or short steel rods. These pieces would be propelled at high velocity out from the mine. The average time between the triggering of the mine and the propelling charge being set off was 3.9 and 4.5 seconds. This time would vary based on the condition and age of the mine. The rated lethality range of the mien was 66 feet (20 meters) and could inflict casualties out to a distance of 330 feet (100 meters). 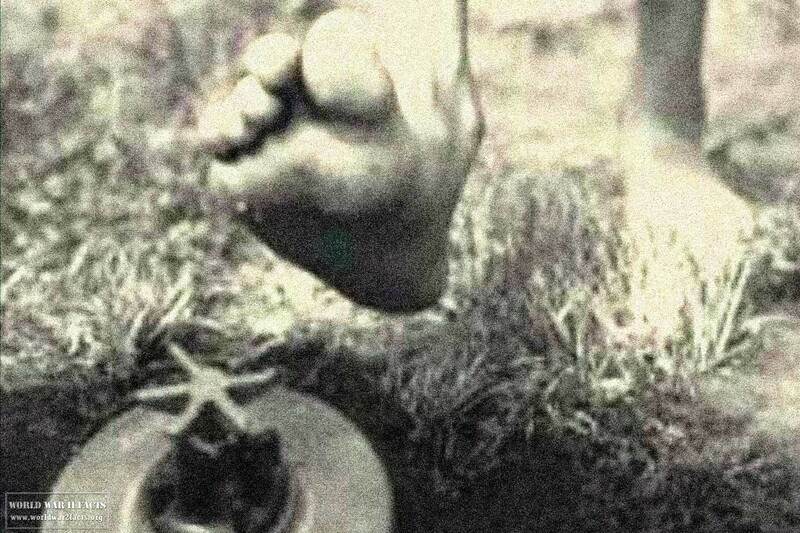 Unfortunately, due to some bad propaganda that got out in the United States during WW2, there was a myth that spread that if a soldier stepped onto a S mine, it would not go off until stepping off of the trigger. This was incorrect as the mine trigger did not wait for the pressure to be released before activating the device. If one chose to run or stand still after activating the mine, it would prove equally deadly. After analyzing the mine, it was determined that the best method to attempt to survive the detonation was to drop to the ground and lay day with one’s face to the dirt as quickly as one could do so. This would not necessarily guarantee the mine would not harm you, but would minimize the amount of shrapnel the body would get hit with from the mine. How was the S Mine Detected and Disarmed? Since the German S mine was made up of mostly metal components, it was susceptible to being detected by metal detectors in the field. There were not a large number of these devices deployed to Allied infantry units; however, so the alternative method was to probe with a bayonet or knife a low angle in the ground. The probing action had to be accomplished at an angle, or the action would set off the pressure sensor of the mine. Once discovered, he soldier would place a pin into the safety pin hole of the device to prevent it being set off. If there was an electrical trigger or tripwire affixed to the mine, then the soldier could simply could the wire. Sometimes the Germans would affix additional booby traps to the tripwire, so experienced personnel would normally neutralize this setup for the S mine. In order to completely neutralize the mine (without detonating it), there were three plugs on the top that could be removed in order to access and remote the three detonators of the device. Alex Kershaw. The longest winter: the Battle of the Bulge and the epic story of WWII's Most Decorated Platoon. Cambridge, Ma. Da Capo Press 2004, ISBN 0-306-81304-1, pp. 21, 47. Cornelius Ryan. The Longest Day. New York: Simon and Schuster, 1994, ISBN 0-671-89091-3, p. 162–163. US War Department Technical Manual TM-E 30-451: Handbook on German Military Forces, 1945 (Ch. VIII, Sec. V.5.a-b), Last Viewed: 13 December 2013. Finland Land Mines Part 2, JaegarPlatoon.net, Last Viewed: 13 December 2013. 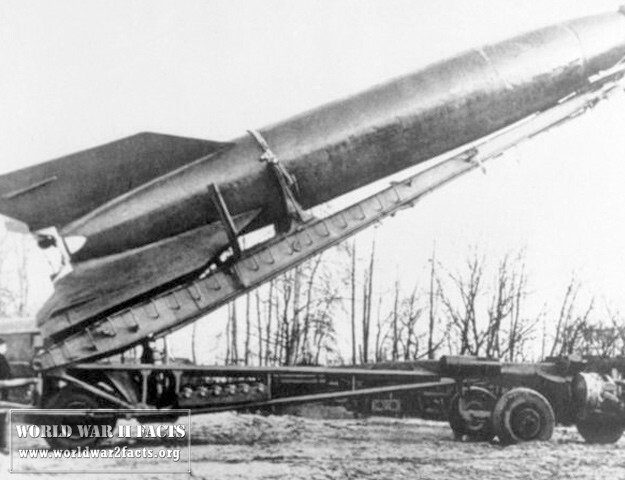 SMi-35 Mine, World War 2 Wikia, Last Viewed: 13 December 2013.